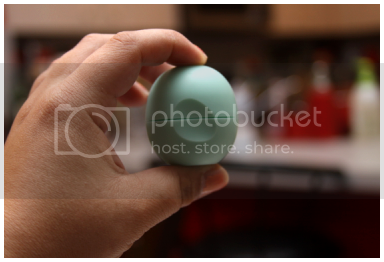 EOS Products Review & Smooth Sphere Lip Balm Giveaway - CLOSED! In addition to drying out my skin completely, pregnancy has affected my sinuses like you wouldn't believe. (Or if you're unlucky enough to have a deviated septum and all sorts of allergies like I am, maybe you would believe it.) I find myself sleeping and breathing through my mouth, thus waking up with terribly dry lips that are just another added discomfort. The EOS Smooth Sphere lip balm totally saved my lips. They're packed with jojoba oil, shea butter and vitamin E and they keep my lips feeling super moisturized. I already tossed in one of mine into my hospital bag to keep my lips moist after I give birth. On a totally superficial note, the EOS Smooth Sphere lip balms are totally cute and fun! They come in bright colors and are in a sphere shape (if you haven't figured that one out yet) with a twist-off cap. They apply directly to your lips so you don't have to dip your fingers into a pot of messy lip balm and their great shape means they won't get lost along the rubble of your purse like traditional tubed lip balms. They're always easy to grab when you need them! The great folks at EOS also sent me some of their awesome hand lotion to try. I was in love with the fun shape from the moment I pulled it from the package! The modern, sleek shape is perfect for keeping in your pocket if your hands are as miserably dried out as mine are and it's so compact that it can fit perfectly in any handbag. I'm not usually a fan of any types of creams or lotions. I hate that slimy, oily feeling that comes with them so much that I find it impossible to even apply oils or lotions to my stretch marks (and, trust me, there are a lot...I resemble a zebra these days) without writhing around in discomfort. With my aforementioned allergies, I'm not a big fan of over-perfumed scents, either. 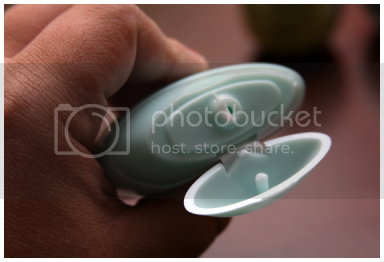 I was so pleased to discover that the EOS hand lotion wasn't even slimy in the least bit. Once I applied the lotion to my hands, they simply felt soft without a single trace of oil or residue left behind! You know those wax treatments they do when you get a manicure that make your hands turn silky soft instantly? It was kind of like that. No sliminess, no oil, no grease left behind. I was also so pleased that there wasn't a ton of heavy perfume. Instead, the very subtle cucumber scent was slight and refreshing. The hand lotion is 97% natural and contains aloe, shea butter, vitamins E and C as well as oat extract. While this one isn't gluten free due to the addition of oat extracts, it's still paraben free and hypoallergenic. I am honestly amazed at how soft my hands feel without that left-behind residue that many hand lotions contain. The great folks at EOS don't stop there! They have a slew of lotions, shaving creams, lip balms and other products. To learn more about EOS Products and to purchase some of your own (which I can't recommend enough), visit their online store or website! Oh, but they don't stop there either! 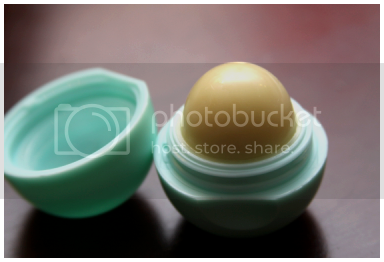 EOS has offered one of my readers a chance to win your own Smooth Sphere Lip Balm! (US entries only, please.) Here's how! 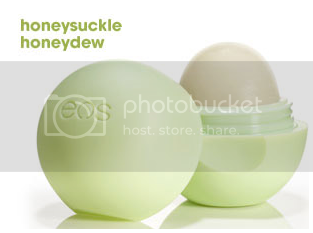 Win an EOS Smooth Sphere Lip Balm in Honeysuckle Honeydew! 1. Add EOS Products on Facebook. Leave me a comment with your Facebook URL so that I can verify this step has been completed! 1. Add You Are The Roots on Facebook and leave me a comment with your Facebook URL so that I can verify this step has been completed! 3. Vote for You Are The Roots on Top Mommy Blogs & Picket Fence Blogs by clicking the buttons on my left sidebar (can be one once daily and counts as one entry; please comment to let me know this has been completed!). Please make sure your e-mail address is accessible/public or leave it with your comments! Good luck! Giveaway closes on Tuesday 6/14 at 10:00 AM EST. Actually, I can't truthfully complain about anyone in my life right now. I feel a little guilty that my family members and husband have all somehow been recruited as my waitstaff. Not that I'm having the time of my life stuck within the confines of a bedroom and relying on everyone else to get a drink of water or slices of watermelon from the refrigerator for me. I'm starting to feel like a bridge-dwelling troll of some sort and starting to resemble one, too. My ideal day isn't exactly one trapped indoors in an old tank-top and a pair of my husband's high school gym shorts. I swear it. Ethan is doing great, though, and that's really all that matters. He had me up for most of the night kicking at and bouncing on my bladder but I can't complain when he's active, even if it's at four in the morning. I know that someday soon I'll miss feeling his little tugs, kicks and jabs causing havoc on my insides. The pregnancy websites are saying that he should be a little more than four pounds, but I know from my ultrasound last week that he's probably about five pounds by now. He should be losing his wrinkled look as his skeleton continues to develop and harden. This week, Ethan's respiratory system is mostly mature. That's pretty great news although, of course, I'm still banishing him to stay put where he is for a few more weeks. Ethan can detect light and tell the difference between day or night, though I don't know how much he's able to hone those skills when we're trapped indoors like we are. My favorite prenatal fact of the week would be that his pupils can dilate and constrict in response to light! This whole pregnancy, I've been guilty of complaining and moaning about having to put any effort into my appearance. Make-up? Hair? Clothing other than my husband's t-shirt and my underwear? No, thanks. Not happening. It's funny how a week (okay, not even) of bedrest will change that. When I wasn't allowed to go anywhere other than the couch or the bed, suddenly I missed going out in public and all that came with it (i.e. making myself look somewhat presentable). When my doctor gave me the okay to keep my haircut appointment and my maternity portraits today, it felt like such a treat! Originally, we had planned this great outdoors-y maternity shoot for this evening with our favorite photographer, Debra Weisheit, in Jupiter. Unfortunately, one of the rules of breaking bedrest was not a free-for-all pass to do all sorts of crazy things like hike through parks on a photographic adventure. At first I was admittedly distraught but Debra is awesome and we moved our session to the studio. We've been lucky enough to work with Debra on so many occasions now -- including our wedding -- and we're obviously going to use her for photographic purposes from here to eternity. So why not save the great outdoors-y photo session for a family shoot when Ethan is here, right? Right. There were last-minute problems that bedrest made impossible to tackle (i.e. our "outdoors-y outfits" were the only ones we had purchased) but Debra, like always, came through. We ended up having a great session in the comfort of her air-conditioned, indoor studio and I was able to break free of the bedrest to make our maternity pictures a reality. And, not going to lie, it's kind of nice after being tucked away in a dark house for a week to get out and feel pretty (and pregnant)! Today marks 32 weeks and my 4th day of bedrest. I've finally come to an understanding with the bedrest issue and have been trying to just take it for what it is and not add extra worry or stress to it. Which isn't to say I'm not going completely stir-crazy laying in bed all day long, but I digress. 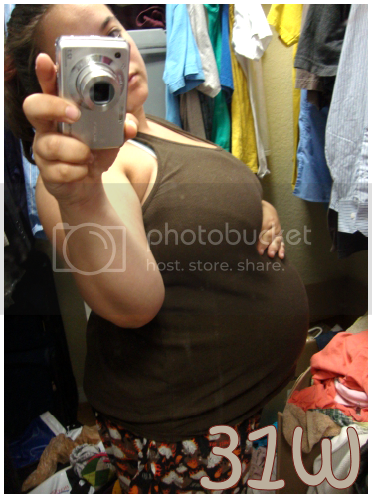 I've accepted the fact that aside from bathroom trips (and to snap my 32 week belly photo), my place is planted in bed. Or, you know, my mom's bed. (Sorry, mom!) I also couldn't do it without the support and encouragement that I've received from friends, family and all of you guys out there in "the blog world." As insignificant as it sounds, I just wanted to say thank you for all of the encouragement and support I've received between comments, e-mails, phone calls, text messages...you're all awesome. Thank you! The only other bits of news I have would be that my husband has come down with some icky sore-throat sickness of doom that I want no part of. That said, he brought me over my Snoogle and a bag of some of my things and I've officially checked into the hotel that is my parents house until his germs are 100% gone. (Time for another "sorry, mom!") In a bit of better news, my doctor did clear me to keep my haircut appointment tomorrow morning. Not that sitting in a salon chair and getting my hair chopped off is strenuous physical activity in any way, but it will still be nice to venture out of the house -- even if I'll still be seated the entire time when I reach my destination. A change of scenery will definitely be welcome even if I'm still planted in a chair. As for little Ethan, he should be somewhere around 16 inches and around 4 pounds. We have an ultrasound scheduled on Monday to get his updated measurements so we'll soon learn how accurate the guesstimated measurements are. His skin should be wrinkly (and cute!) with more vernix coating it, preparing him for delivery. He could even gain up to two pounds by the end of the 8th month of my pregnancy! Even though his bones still haven't fully hardened and are a bit soft, his skeleton is fully formed. 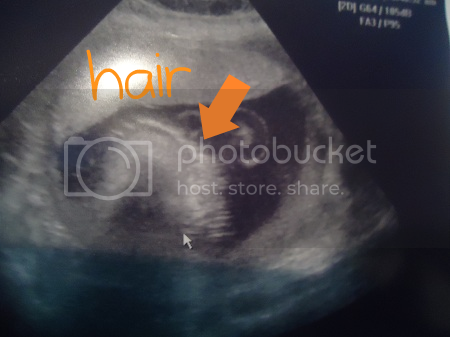 His head should be coated with hair which I am eager to see if we can pick up on ultrasound! My husband and I both were born with enough hair to make wigs for every bald baby in the tri-county area, so I'm curious if Ethan inherited that trait. Also pretty cool this week? Ethan has developed a sense of temperature! If I were to put a hot compress on my belly, chances are he'd try to kick at it. But, please, I'm hot enough with the air cranked down to 71 degrees (no, really, I'm dripping in sweat) so we'll keep the hot compresses as far away as possible. ...also known as the room I hijacked from my poor parents! 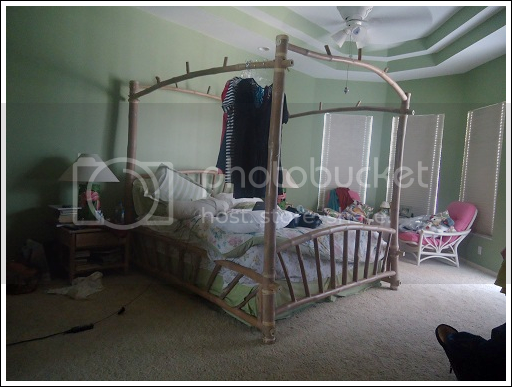 Those are my water bottles on the nightstand, my bag of stuff (and my Snoogle) across the bed, my clothes hanging from the bedpost and more of my stuff strewn about everywhere. When this is all over, I'm pretty sure I owe my parents a vacation. As I type this, Ethan is busy kicking up a storm. Maybe that's his way of saying he's totally cool with the bedrest thing. And, um, hopefully he's not learning too much from the Real Housewives episodes I've been admittedly watching way too many of on OnDemand. I debated making this post yesterday but, to be honest, I haven't been able to wrap my mind around the entire incident. My mind still isn't fully there and I feel sort of trapped in some kind of fog but here it goes: as of yesterday morning, I've been put on bed rest for the duration of my pregnancy. Positive-thinking friends and family members have pointed out that it's only 7 weeks (as of Thursday) and that I should enjoy this as my final time of rest and relaxation before it's gone forever. And, yes, I'm sure it's true there are worse things to do than lay in bed while being served snacks and drinks, watching Roseanne and a non-stop marathon of films on the Sundance channel. Still, though, my mind is consumed with worry. Please read "worry" as "terror" and it's a more accurate description of my current mental state. The reason for the bed rest is because I started spilling protein in my urine. At first it was within the normal ranges -- but on the high end of normal -- and then it made it's way over to the high end in general. With words like "preeclampsia" dancing on the horizon, I'm trying my best just to stay calm. Calm and collected. Enjoying watching Detroit Rock City while eating my mom's freshly cooked pudding. However, all I can really think about are my now weekly doctor appointments, all of the monitoring in my future and the fact that all of that monitoring is to make sure there is nothing wrong with the little boy inside my belly who I have grown to love more than I could ever love anyone ever. The very notion that there is a problem, that my body is failing him, it's unsettling. Being told that this happens to many first time mothers without rhyme or reason, that there was nothing I could have done differently or nothing I can do to stop it makes me feel even more frustrated and helpless. There's nothing I can do from here. I can't just hold him and protect him and make the problems go away. I'm stuck laying in bed, trying to ignore the horror stories of others involving steroid shots and lung development and preeclampsia and uncontrollable bleeding during c-sections. I'm stuck in bed resisting the urge to Google (like I promised my wonderful doctor I would) and trying to find solace in Partridge Family reruns and carrot sticks served to me bedside by my doting mother. I'm stuck laying in bed trying to relax but really just waiting to feel him kick or stretch or hiccup in there every single second so I can be assured that he's okay. Because, really, nothing else in the world matters at this point. Nothing at all. While my husband works, I've "moved in" to my parents house during the daytime hours. 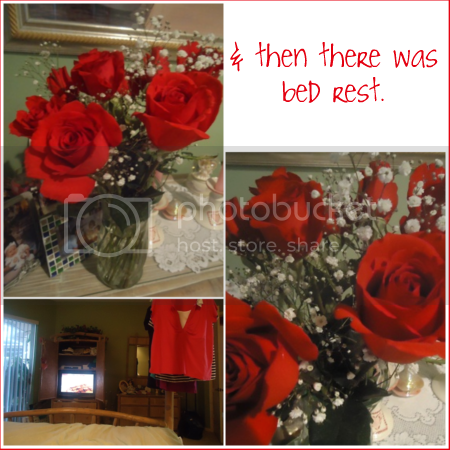 I've planted myself in my parents bed (see photo at bottom right) while my wonderful mom runs all of my errands. She buys my cat litter, she buys our groceries, she makes impromptu stops at the maternity store to surprise me with comfortable loungewear and nursing clothing (what you see hanging in the photo at the bottom right). My mom runs around all day long between taking my sister to school, dance, tutoring and all of her other SuperMom duties and now she's added another one to the mix: taking care of me as I lay in her bed absolutely miserable. I'm managing to write this entry now because my spirits have been lifted thanks to the love and support from my awesome friends and family. Today my good friend, Nea, stopped by to visit me. She brought me the beautiful flowers that you see in the other photos. We had lunch and she hung out in bed with me for a few hours. I was able to have a conversation and spend time with my super thoughtful friend and, really, by the time she left I felt like a whole new, happy person -- a total switch from yesterday (and this morning, even). Today my cousin, Mike, also stopped by to visit me on his way from his internship to his next job further down south. Laying in bed and this time being surrounded by visitors made all of the difference in the world. Between friends and family, it's safe to say that I'm an extremely lucky person. And so somehow, I suppose, I will get through this. I will dutifully remain in bed. I will dutifully attend my once-a-week doctor appointments for monitoring. And I will be brave for Ethan...because that's really all I can do at this point. Just force myself to be brave for Ethan. I actually just didn't get around to composing this entry yesterday but we can lie and blame the lateness of this entry on Blogger being down (which I just found out that it has been). What you see is what you get in today's belly photo...and that is that I am not getting out of my pajamas all day! No way, no how! Yesterday was a mess involving enough grossness that even I, the "there is no such thing as TMI" extraordinaire, am too grossed out to reiterate again. It ended in an impromptu visit to my doctor's office where I was told I have pregnancy-induced lactose intolerance, as can sometimes happen at this point in pregnancy. I'm supposed to stay off dairy through Monday to see if my problem resolves itself...which I'm pretty confident it will, since it's just shy of 24 hours that I've been off dairy and already I'm feeling a thousand times better. I'm not taking this potential diagnosis very well considering I'm already allergic to soy/soymilk and my husband has Celiac disease (thus a gluten intolerance) so my House Of Food Allergies has just gotten that much more complicated. I'm also not sure how I'm supposed to live without dairy. It's kind of the biggest staple in my diet. Life goes on, however. 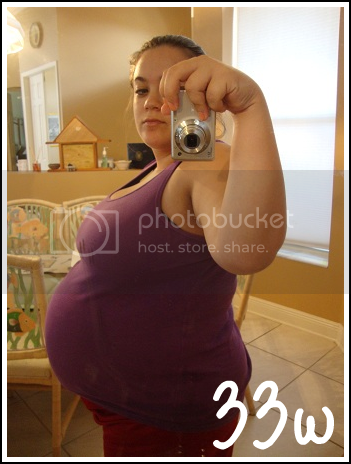 Eight weeks until my c-section! Ethan has started measuring big (we have an ultrasound on May 23rd to take some new measurements) but I'm hoping he holds out for those eight weeks. Ethan's bassinet was delivered yesterday and is now joining the ranks of big boxes cluttering up my living room because time is in such short supply and there is just so much that needs to be done and set up (eight measly weeks -- ack!). There's this part in one of my favorite movies, Away We Go, where this woman walks up to Verona and says to her child, "this lady is about to have a baby. Any day now!" Verona responds with an, "or in three months." I've gathered from even before I was pregnant that this is something people say to pregnant people a lot. I'm pretty sure I read accounts of this by offended moms-to-be everywhere more than twice a day on pregnancy forums that I follow and I myself have already gotten this quite a few times. I guess maybe I'm just weird (okay, we all know that I am), but it doesn't really bother me. The "are you sure there's just one in there?" or the "no way will you make it to July" or "are you due any day now?" comments really don't get to me. What bothers me is the never-ending assumption that I'm some single 12 year old girl who has found herself pregnant and in dire need of advice and sympathy from strangers. Because, let me tell you, that gets old. And it gets old fast! My most recent case of this was while Mother's Day shopping at Yankee Candle. The older female cashier nodded her head to look at me and asked the ol' "oh, are you having a boy or a girl?" It seemed like an honest enough question. I went back to my browsing and told her it was a boy. "Your parents must be so excited." I looked up where I was greeted with this sympathetic little face, pouty lips and a tilted head. Oh, I realized, it's happening again. "So is my husband," I smiled and received the shocked look back I was waiting for. "Your husband? Oh, honey, you're so young!" At this point, she wasn't doing much to hide the fact she was -- for some reason -- absolutely heartbroken. "Not really...I'm 25." I say this and wait for the inevitable look of comfort to take over her expression. It does. She loosens up her posture and stares at me as if I just told her she won the lottery. "Oh, thank goodness. Oh my, thank goodness." She's clasping her hands and praising someone or something that I am, in fact, not 12. Because, apparently, it makes such a difference in her life. This happens to me all of the time. In the grocery store, I'm told by a fellow shopper how lucky I am that my baby will arrive once school is out. 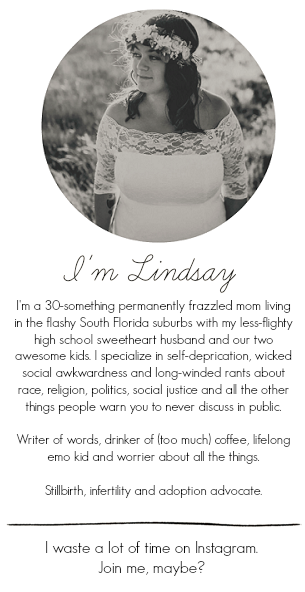 I receive the stares, points and head-shakes from passerby at the mall, the grocery store or even public restrooms. I've gotten the sympathetic "oh, honey, don't you want to finish school first?" from some lady in the Target check-out line who feels she must spread her sympathy like wildfire. And this, my friends, is my biggest pregnancy pet peeve. More than the leg cramps, the heartburn, the nausea, the inability to sleep, the "oh god, you're fat!" comment from strangers who think their due-date guessing is the greatest thing since self-serve frozen yogurt. I can recognize that tilted head, pouty lip, look of pity anywhere -- and I hate it. 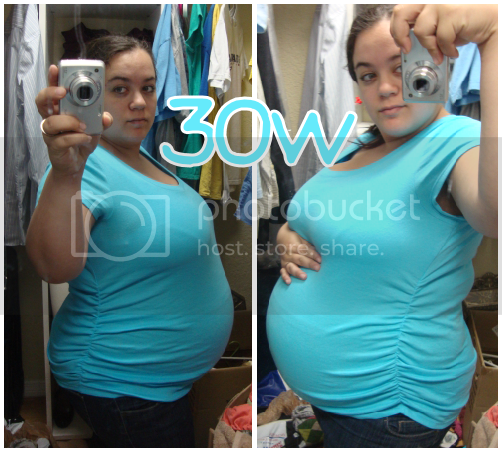 Today marks 30 weeks! I'm not sure why this feels like such an exciting milestone but it just does. 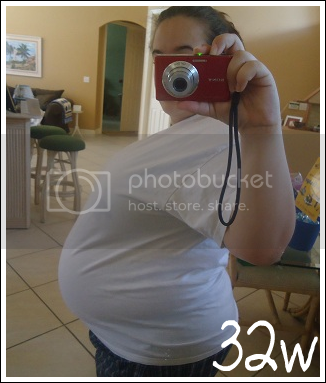 It also marks exactly nine weeks until my c-section. 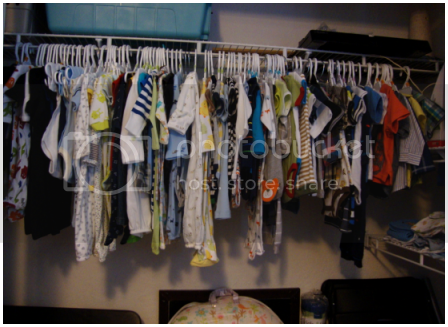 Nine measly weeks until Ethan will be here! I feel like there's still so much left to do (probably because there is) around the house and in the nursery but I'm refusing to let myself panic about it. We'll see how well that goes. I'm feeling gigantic and uncomfortable. Sleeping even remotely through the night is a long-ago memory. If I'm not getting up to pee a hundred times, I'm getting up in sheer discomfort. That third trimester exhaustion has definitely kicked in but I'm trying my best to still get in my daily swimming (which is sometimes rendering impossible thanks to those horrible Florida storms). An exciting milestone was that we turned in our pre-registration forms at our hospital. Not only does Ethan have a "happy birthday appointment" on July 7th, but he has a file and a pediatrician and all of these other things that make it feel so incredibly real! Ethan should be around 14-17 inches long and should weigh about 3 pounds. His lungs and digestive tract are fully developed and functional now! His eyes can open and close in there and he can differentiate between darkness and light. Vision is still developing and won't be too keen for quite some time after his birth. The bone-marrow is completely in charge of red blood cell production now. Ethan is losing his lanugo and is better able to regulate his body temperature.